As the Hot & Sultry Summer fades away, and the refreshing Fall approaches, we need to adopt this new season too, be it with respect to donning of new clothes or accessories for the fall. 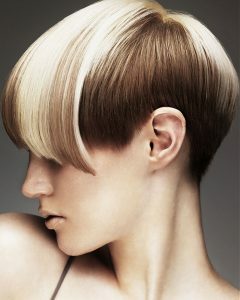 Just the way we adapt to new styles as a new season beckons, there also arises a need to change our hairstyles. The reason being, that not all hairstyles are suited to every season. So this Fall, press your ‘Refresh’ button, browse and get new, chic hairstyles which suits perfectly to your psyche. So, let me give you a gist of the head-turning, trendy hairstyles that you can adopt this fall, that would surely make others “fall” for you in a jiffy! Sometimes even a simplest of style can make a huge fashion statement. The same can be said of Half-tuck hairstyle. Instead of tucking your hair completely behind your eyes, you can take “half” of it behind your ears and let loose few deliberate curly/wispy strands, making it simple, yet sensuously sophisticated. It gives an elfin-like view of your eyes which can make many hearts beat faster! Boyish Hairstyles for the girls are totally “In” this fall! As we adopt the fashion statement from the latest clothes worn on runway, we tend to adopt the hairstyles in the similar way. You can use a lot of gel or mousse to get the slick hairstyle that guys usually flaunt. You can flaunt your feminity with ease by wearing clothes along with sporting tomboyish looks, which adds to your charisma. If you are looking more for messy girl-next-door look, don’t forget to try this super-cool Side-Braid! Be it going to watch games with your pals or out for an official do, this hairstyle always works wonder! You can use spray to increase the volume of your hair and to create messy layers. Then take the hair to one side and start braiding, and then tie it up with a cute ribbon at the end! ‘What goes around comes around’. This saying is appropriate, especially with respect to this hairstyle! As the new suggests, it draws inspiration from the ponytails sported in 1960’s. When somebody talks of a ponytail, a simple ponytail pops up in everybody’s mind. But it is a misconception, because there are variety of ponytails. Let me give you an idea of how to do a 1960’s ponytail. Firstly, create a side-parting for your hair. From the crown of your head take a section, so that people see a T-shape parting when viewing aerially. Backcomb the back section of your hair and create a volume on your head just above the ponytail, so that it gives off more of a sixty-ish look. Now take all the hair and tie it up at the nape with a ribbon/band. Pull every loose strand at the back of the head and pin it up to the ponytail. This would give a neat and tidy look and would also echo of the past which is back in fashion yet again! The half-up, half-down portrays understated romance in the women who sport wavy, dreamy hair. This hairstyle can be donned in damp hair and then liberal amount of hair mousse is applied along with crunching the hair to give it a more natural wavy look. Part the hair from the middle and then let the hair dry. Take two small sections of the hair from each side of the part and pull them backward to the crown of you head. Twist them in to sections and pin it at the back of your head using a hairclip and voila! You get a trendy, stylish hairstyle with your wavy hair! This hairstyle screams classic as it brings back the hairstyle donned by beauties in the 1940 era, with flowing wave sweeping across one eye, giving a look of sophistication to the woman sporting it. Side waves are in fashion again, just divide them into two sections and spray your hair. Then blow dry it completely and then start curling sections of your hair. Take each curl and pin it up at a place for some time and then release the curls. Let down your hair and brush it to create soft, sweeping waves. Part your hair, keeping the bigger section of your hair sweeping over one eye. There you have it! You would ooze of effortless charisma. Confusing name for a hairstyle, right? Faux-hawk is a hairstyle which can also be explained as a cross between a mohawk and top-knot. This hairstyle comprises of simply combing up the hair in the middle section and slicked back at the sides to give it the look of a Mohawk, but in a more feminine way. Sounds crazy, but in a good way! Divide the hair into 4 sections and leave behind some hair at the bottom as the 4th section. Tie the bottom section of hair with a band to avoid intrusion in further process. Continue tying each section until you get 4 ponytails. Start tying knots with the bottom two ponytails and continue making knot chains. Backcomb each section with your fingers and repeat the same steps with the two other ponytails left and tie them into knots and knot-chains. Secure the front ponytail with a hairspray and get ready to flaunt your trendy faux-hawk look! This style may scream Rock n Roll, but half-up pompadour is all about being classic, sophisticated and timeless. With a glimpse of this Hairstyle, you think it is something difficult and not a do-at-home hairstyle. But it isn’t so! Let us recreate the magic! Blow dry and brush your hair (backcombing) and spray on it to keep the backcombing together. Pin up the sides of the hair behind your ears with pins/clips and keep backcombing the top of your hair until you get a pompadour shape that you prefer. Spray the pompadour to keep it in shape and then secure it with a clip. Loosen the other pinned hair and get ready to party!